Pressure Washing Or Power Washing: Which One Should you Choose? Pressure Washing Or Power Washing: Who Wins? Hey there, neat freaks! Hope there are many of us who like to be surrounded by tidiness. 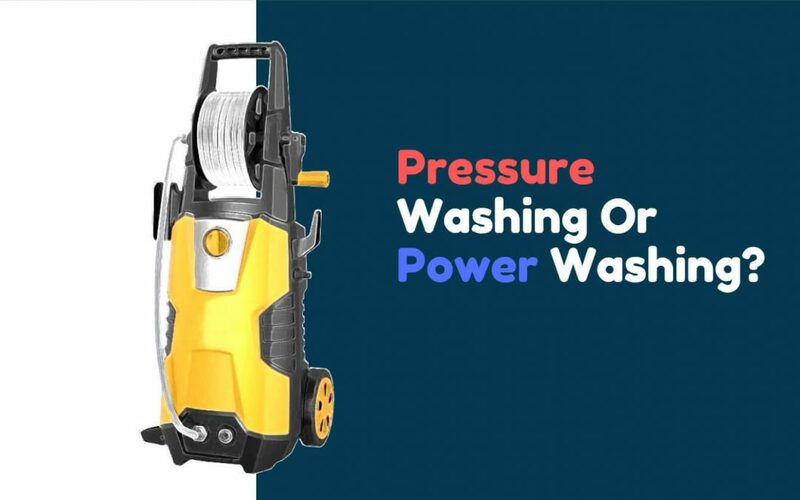 Have you ever made use of Power Washing and Pressure Washing machines? Some may say “yes, and there’s no big difference between the two”, but if you have a cleanomania (such word doesn’t exist, we just like to create new ones) you know the difference and similarities and if you don’t just keep reading and add this information to your pretty-perfect memory card. Let us note that both processes end up with satisfying results. They both use water: This transparent liquid of life is absolutely insane. Both power washing and pressure washing use pressurized jets of water to clean surfaces. So here’s the first similarity of two. They both use pressure: Both power washing and pressure washing use a high volume of pressure to help clean hard surfaces like concrete. In fact, the amount of pressure used in both systems is often the same. What’s the difference between Power Washing and Pressure Washing? Temperature a.k.a the Heat: Yes! These two use pressure and water, only power washing uses heat to clean. Pressure washers usually use cold or tepid water. Cold water pressure washers rely on the mechanical force of a pressurized water jet to dislodge dirt from the surface that needs to be cleaned. When it comes to tackling oily or greasy stains that can be found on hard surfaces such as garage floors, pavements and driveways, power washing is the winner. These washers heat up the water to extremely high temperatures while still also using high pressure. Friendly advice: Leave it to the professionals! Both of these methods are effective. You can choose to either do the work yourself or hire an expert to help. If you want to rent the equipment to do it yourself, be sure to follow the safety tips, but it’s better to trust the power washing specialists. Read the instructions carefully. Make sure you understand how to operate the sprayer and machine before you get started. Check the water and electrical connections before getting started. Make sure the connections are secure and avoid spraying water directly on electrical outlets. Use safety glasses to protect your eyes from any debris that may fly up from the water pressure. Don’t stand too close to what you’re spraying to avoid the risk of injury. Test the water pressure on a durable surface before washing windows. Start with the lowest setting to make sure you don’t accidentally shatter a window. Soft Washing: Your Optimal Washing Solution? Soft Washing: optimal washing solution and when do you need it? on Pressure Washing Or Power Washing: Who Wins? Pressure Washing America, LLC provides quality commercial and residential power washing services in Houston Texas. With years of experience we can freshen up your house exterior, clean patio, roof, or windows.